BOSSY BETTY: It's Brownie Time! 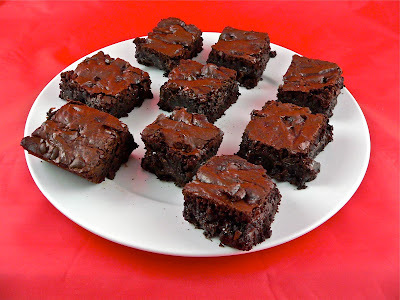 Brownies--those yummy, chewy cobblestones on the road to happiness. Betty luvs brownies and believes we should all make them an integral part of our mental health regime. I have been looking for a good recipe for a long time now and I have HOB and his penchant for the exotic to thank for this one. You see, I sent the man to the store for flour. Being the down-to-earth girl I am, I normally get the store brand. Oh, if I'm feeling frisky and a maybe a little risque, I'll spring for Gold Medal but HOB just went right into that store and grabbed that fancy King Arthur flour like he was a Lancelot and Arthur himself had requested baking supplies--you know, so he would whip up a batch of cherry-almond cupcakes for the next meeting of the Round Table guys. HOB came in, placed the bag on the table and there it was, written on the side of the bag, like an ancient text come to light at long last: a recipe for brownies that pushes the boundaries of all things chocolate. It uses Dutch-processed chocolate which we have discussed in detail in this blog before. You must go to Williams-Sonoma, throw all caution to the wind and buy a can. Yes, it is hideously expensive. Yes, this recipe uses about half a can. The good news is that the overly-solicitious lady at Williams-Sonoma lady will put your can in a lovely little bag with a rope-like handle that you can use as an attractive purse. In a medium sized microwave-safe bowl or in a saucepan, melt the butter on low heat, then add the sugar & stir this to mix. Return the mixture to the heat or microwave briefly, just until it's hot but not bubbling. It will become shiny looking as you stir it. Heating the butter & sugar a second time will dissolve more of the sugar, which will yield a shiny top crust on your brownies. Transfer the mix to a mixing bowl. Stir in the cocoa, salt, baking powder, & vanilla. Add the eggs, beating until smooth; then add the flour & chips & nuts if using. Beat until well mixed. Bake the brownies for 28-30 mins, until a cake tester inserted in the center comes out clean or with just a few crumbs clinging to it. Remove from the oven, & after 5 mins loosen the edges with a table knife, this will help prevent the brownies from sinking in the center as they cool. Cool completely before cutting & serving, or, if having a bad day, wait until brownies have cooled only slightly, then insert face in pan and enjoy. please make them again, soon!